The nervous system is the most important organization which Controls and integrates the different body functions and it maintains stability or constancy of the internal environment of the body. The nervous system is responsible for three basic functions called sensory function, integrative function and Motor function of the body. The main aim of this article is to communicate the differences between central nervous system (CNS) and Peripheral nervous system (PNS). Central nervous system (CNS) is comprised of brain and spinal cord. Various sorts of sensory information are integrated and correlated within the central nervous system. In central nervous system, thoughts and emotions are generated and memories our farm and stored. 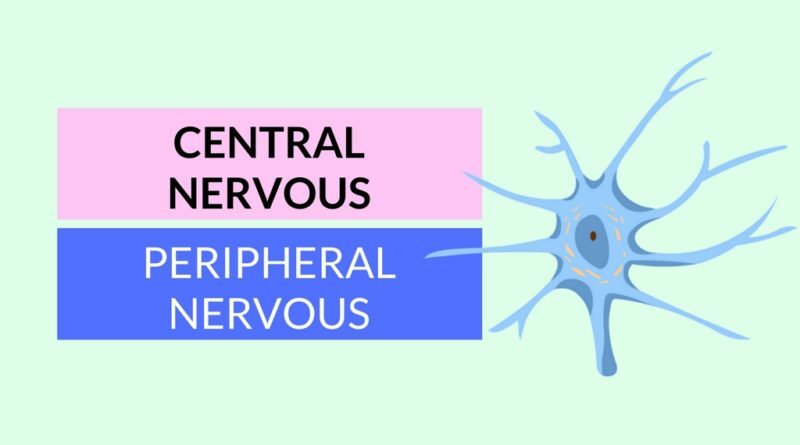 Peripheral nervous system (PNS) is comprised of cranial nerves that are arising from the brain and the spinal nerves that are arising from the spinal cord. The nerve cells called sensory neurons or afferent neurons are the main input components of the Peripheral nervous system (PNS). The nerve cells called Motor neurons or efferent neurons are the how to put components of the Peripheral nervous system (PNS). Central nervous system (CNS) consists of brain and spinal cord of the body. Peripheral nervous system (PNS) consists of dorsal and ventral root nerve cell heads, spinal and cranial nerves. Central nervous system (CNS) Controls all the voluntary functions of the body. Peripheral nervous system (PNS) Controls and influences all the involuntary functions of the body. Central nervous system (CNS) is a system of sensory nerves and motor nerves linked with brain and spinal cord in a to and fro manner respectively. Peripheral nervous system (PNS) is a vast system of dorsal and ventral root nerve cell heads and the network of spinal and cranial nerves that are linked to the brain and the spinal cord on one end and muscles on the other. The main functions of the body are controlled by brain. The PNS involuntarily control several functions of reasons like internal organs, blood vessels, smooth and cardiac muscles. The CNS Is connected to sensory receptors, muscles and glands in Peripheral parts of the body by the Peripheral nervous system. The sensory neurons contract nerve impulses from sensory receptors in various parts of the body to the central nervous system. From the above discussion it is clear that the central nervous system (CNS) Controls the voluntary functions like walking, laughing, reading, etc. and Peripheral nervous system (PNS) is responsible for the involuntary actions like blinking of eye, heartbeat, digestion of food, etc.